On the 25th of February The Mechanisms, a steampunk space pirate storytelling band from Oxford, opened Tea-Powered Theatre’s 2017 Teatre season with their brand new epic tale The Bifrost Incidient. The Bifrost was Odin’s life work, a train capable of travelling between planets in a matter of days. It never arrived at its destination, however, and was lost to history on its maiden voyage. Listen through the black box recordings to find out what really happened on the journey, as told to you through a mix of storytelling and song. 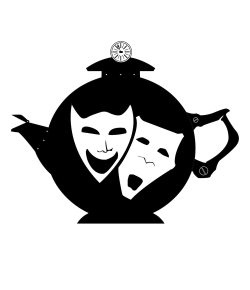 Since 2012 The Mechanisms have presented several well-received shows at the Edinburgh Fringe Festival. With anything up to nine members playing more instruments than you can count, they re-work traditional songs and weave them into dark stories from possible futures. So far they have told of Snow White’s bloody rebellion against the villainous Old King Cole (“Once Upon a Time (in Space)”, 2012), of the fate of Ulysses, who built a Vault which contains a secret every Olympian in the City is afraid of (“Ulysses Dies at Dawn”, 2013), and of the struggles of the Pendragon Gang to impose order on Fort Galfridian (“High Noon Over Camelot”, 2014). “I’m a sucker for a good twist on a myth or fairy tale. And, once more, The Mechanisms’ brand of musical storytelling was so good that it utterly broke me, leaving m/ e a pitiful (but very happy) wreck of a human.” James Webster, Sabotage Reviews’ Spoken Word editor for London and the South East.